Users might want to check on the system activity in their computer for some reason from time to time, for instance, to check on the CPU temperature, track the memory usage, read process information, and so on. Mac users can use the built-in GUI application, Activity Monitor, to view their computer’s CPU, system memory, disk activity, disk usage, and network processes conveniently. 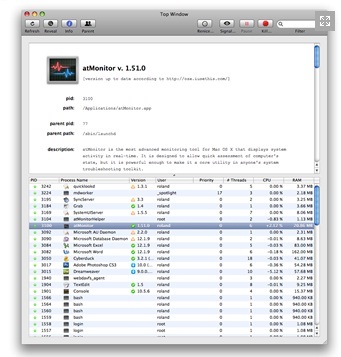 Alternately, Mac users can also try up atMonitor, another advanced system monitoring utility for Mac OS X.
atMonitor is a free advanced monitoring tool for Mac OS X that furnishes users with detailed system activity in real time. The real time information extracted from atMonitor will help users to analyze and assess their computer systems better and troubleshoot technical problems as and when required. Generally, some main information can be obtained via the monitoring tool. Users can get live graphical statistics via the tiny utility. These statistics indicators include CPU and GPU usage, RAM usage, temperature, disk and network I/O and Video RAM usage. Besides these live statistics, users can also obtain system information from their MAC PC such as installed extensions, SMC sensor status, system profiler, kernel state, system logs, I/O kit registry, network connections and interfaces, and startup daemons and services. Besides, atMonitor will assist users to track active process information and send signals to these running processes such as to terminate, pause, suspend, etc the activities. Users can view more detailed information such as process paths, process ID, parent process information, description, etc on a specific process. atMonitor also come with some useful features that users can utilize to monitor their system. atMonitor allows users to log all monitored values. The logs are saved in XML format with names in ISO 8601 standard and can be used to log and troubleshoot system performance. atMonitor also offers users to set up and assign a trigger script to run if any process reaches a certain level. Mac users can download atMonitor via the link here.